Today I want to share a more parent related post here on Captured By Jade; sharing a few our favourite learning resources that we use with Alexander. Of course being a child, most things are a learning experience, and they have many years ahead of them in the way of schooling and education, but I personally think it's quite important to extend that learning outside of a school setting also. Alexander is not yet in school, nor a nursery, and so all that he has learnt up till now has been at home. Every day I try to do a 'dedicated' learning activity with Alexander, as well as read books daily too. I tend to do these in the morning, as he has a better attention span then, and that way we have the rest of the day for fun, fun, fun! All of the resources shared below are activities Alexander greatly enjoys, thrives off of even, and often picks these things up to play with at various other times throughout the day. I'm all for enjoying this young and carefree stage of childhood, without the stresses that may come with school, and so I have a very light approach to these things... If Alexander isn't into a certain activity on a given day, then I will switch it up with another, and if he is still showing little to no interest, then I'll happily put it away. This isn't about forcing learning on him - whilst I'm keen to maintain, build and expand the knowledge he possesses, I have no intention of making learning a chore or a drag, that's why we have a variety of learning tools all of which have an element of fun to them. The resources below are all activities we have used within the two year age group, however Alexander is currently two years and ten months, and some of the activities are aimed at 3+. Flash cards can be a really effective learning tool for people of all ages, but particularly children who tend to be more visual learners. 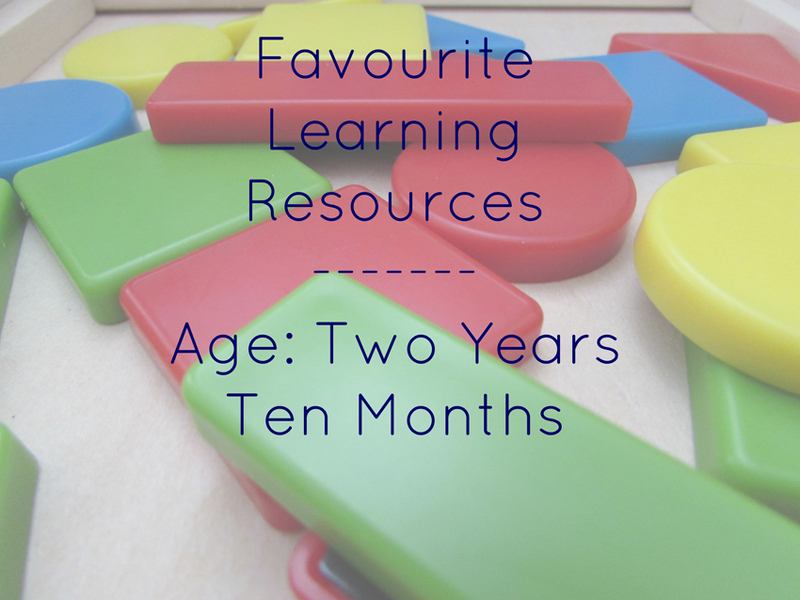 Not only are they great in the display and say method, but if you have a little look online there are a number of activities that can be found using flash cards in a multitude of different ways, especially useful for when a child gets a little older. The first set of flash cards we purchased were of the fun and vibrant variety, showcasing the alphabet and numbers up to ten - you can find them here. Since then we have progressed to a more comprehensive set (we still use the original set frequently) that is actually aimed at an older age then my son but very much usable for younger children too. The set has six sets of cards - Alphabet, Colours and Shapes, First Words, Numbers, Phonics, Sight Words - four of which we currently use (see italic ones) and have proven to be a really useful learning tool. I purchased the set from Amazon (here), however Amazon themselves no longer seem to stock the item. If you were to purchase this set, I would say it's worth noting that some words (very few) are American terms such as trousers being called pants. Having an extensive flash card collection can only prove to be useful as a child gets older and develops a wider vocabulary and understanding of words. We love this magnetic shape board purchased from The Early Learning Centre - also pictured a little above. All stored in a tidy wooden box, the set comes with a magnetic board, ten patterns (5 back to back pages) and good variety of magnetic shapes, with the aim of recreating the patterns on top of the board using the paper and shapes provided. This particular activity has a number of learning benefits including, recognising shapes and colours, counting and also building fine motor skills. As well as the activity provided, what I love about this is that you can use the board for other magnets such as letters and numbers also. Although he had somewhat of a speech delay, Alexander knew the alphabet from very early on. Alexander loves reciting the alphabet, and also matching up images with letters themselves using this 3D Alphabet Card Game that we picked up really cheaply from The Entertainer recently. What I like about this is that it mixes reciting of the alphabet with putting the knowledge to use by having to match up the letter with the corresponding word. I find that as Alexander's vocabulary expands, sometimes things can be forgotten in the moment, and this is often the order of the alphabet or the number 7 when counting with Alexander - little activities like these are great at remixing 'basic' knowledge in a different format to how it has previously been taught. Whilst we read on a daily basis, and that in itself provides many learning benefits, I just wanted to mention a couple of 'non fiction' books Alexander has learnt a great deal from. As I'm sure most of you already know, the publishing company Usborne is great for creating books that are not only knowledgeable, but also fun for little ones - a winning combination when it comes to learning with toddlers. Being a big animal lover, Alexander has learnt about a vast number of animals through the use of 1000 Animals, and more recently we have been working on shapes using Lift-the-flap Shapes. We also have a few books by the publishing company Make Believe Ideas that are creative and yet still educational. WHAT EDUCATIONAL ACTIVITIES DO YOU ENJOY WITH YOUR CHILDREN? We did very many activities and tried to convey the idea that learning is super fun and that for example reading books is self-evidently an essential part of (a good) life. Thank you for the interesting post. Have a lovely weekend! It sounds like you took a great approach to learning, Sara! And reading books is most definitely fun and essential for a good life! Thanks for taking the time to stop by, and comment. Have a great weekend! When little ones start picking favourites, it's such a great stage. We started flash cards between 18 months - 2 years (I don't remember where exactly in that time frame), just 1-10 and also abc's with bright and bold images, but everything else was 2 years plus.